August is all about the hottest parties in Philly and this is on of them. This isn’t just a great event to attend but it benefits Philabunance here in Philadelphia. This is the 1st Annual Cooking Up Couture: An unforgettable night of food, fashion, and fighting to end hunger in the Delaware Valley! Hosted by serial entrepreneur and motivational speaker Jen Groover, the evening will feature a “kitchen couture” fashion show, hand crafted cocktails, and gourmet dishes from celebrity partner chefs including Top Chef Nick Elmi (Laurel), James Beard Award Finalist Brad Spence (Amis), Chopped Champion Georgeann Leaming (SUPPA), Food Network Star Finalist Lovely (Lovely Eats), Hell’s Kitchen Finalist Joy Thomas (Urban Country Culinary Co.), Nathan Lingle (10 Arts Bistro & Lounge)…and more! All proceeds will benefit the Philabundance Community Kitchen- a not-for-profit culinary training program that promotes the self-sufficiency of low income adults by preparing them to work in a commercial kitchen. Each of our chefs will be paired with a recent graduate of the Philabundance Community Kitchen to mentor throughout the evening. I am really looking forward to this event. 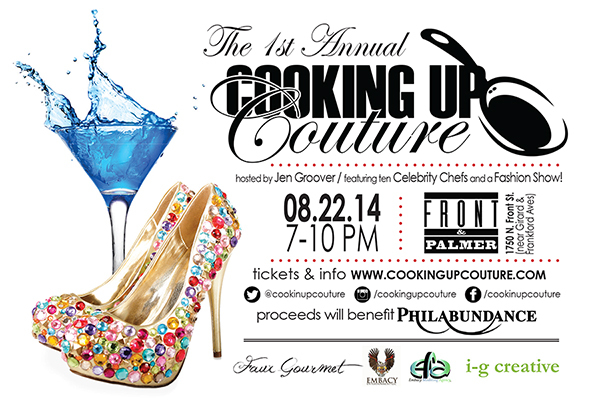 For more information and to purchase tickets visit http://www.cookingupcouture.com/ I hope to see you there on August 22nd. Lets make a difference together. P.S. Another great excuse to go shopping for a amazing outfit.